The biggest challenge faced by workers in Raffles Place is where to buy a healthy lunch for under $7. I have been investigating this issue for more than a year only to come to one conclusion. The only way to eat a healthy lunch for cheap in Raffles Place is to go for Yong Tau Foo. Fortunately, there are three reputable Yong Tau Foo spots in the city although unsurprisingly they all have long queues at lunchtime. Yong Tau Foo is a Hakka Chinese dish that is hugely popular in Singapore. 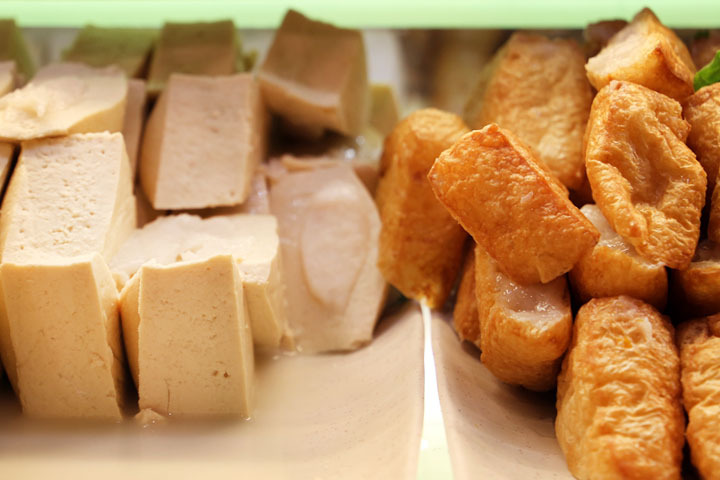 It is pronounced Yong-To-Fu as in young tofu because that is what it essentially describes, fresh tofu that is stuffed with ground fish or meat paste. 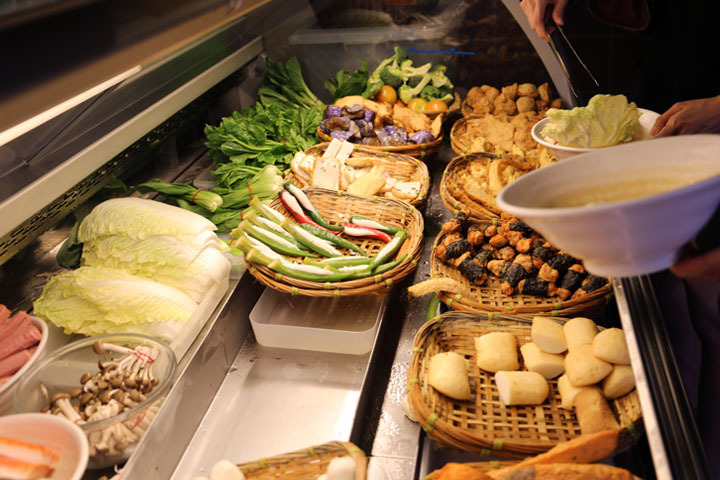 In Singapore the Yong Tau Foo stalls are setup as a self service buffet with different variations of stuffed tofu as well as vegetables, herbs, fried wontons and other proteins like egg and sausage for you to choose from. You simply grab a bowl and pick as many ingredients as you like (the minimum is usually five ingredients). The chef will then prepare your food in the house style according to their recipe and your preference for having it served wet (in soup) or dry (steamed) and with optional noodles. The reason this is the only way to eat healthy for cheap at lunchtimes is because it is the only local food that contains vegetables and which you can opt to eat without noodle or rice. Otherwise a salad or European-styel sandwich will set you back at least $12. Here are the three best Yong Tau Foo places in Raffles Place. 109 is reputed as the best Yong Tau Foo counter in Raffles Place by locals. And you can tell simply by checking out the long queues. If you arrive for lunch later than 12pm, expect to wait up to 20 minutes to place your order. Finding a free table is easier however as they have an abundance of seating outside as well as upstairs. They offer take way for a small additional charge. 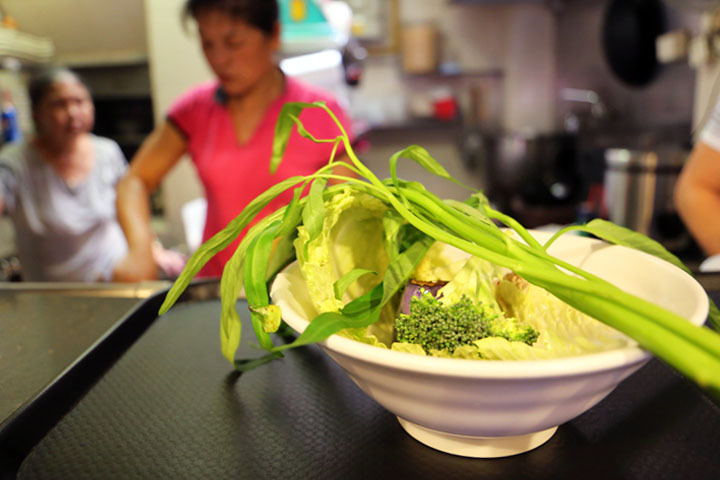 What people love most about 109 is the quality of fresh ingredients as well as the variety. On the left hand of the joint, where the queue starts, there are two wide fridges with more than 40 different ingredients to choose from. Their selection of fresh vegetables is fantastic. 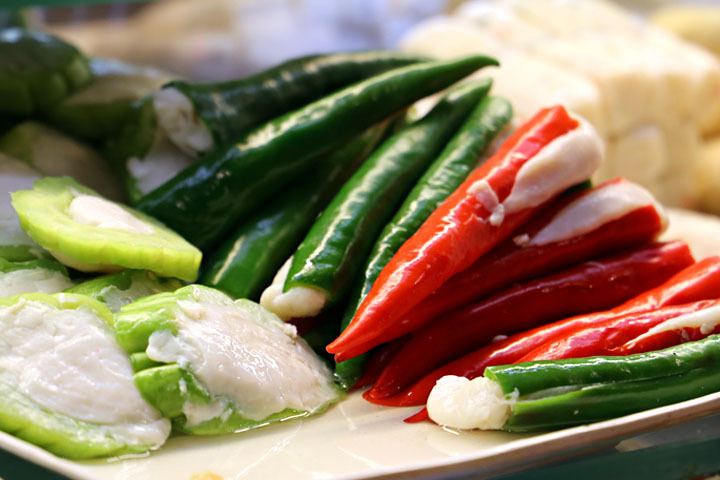 It includes Chinese cabbage, endive, broccoli, straw mushrooms, button mushrooms, aubergine, bok choy, choy sum and water spinach, as well as bitter melon and chillies stuffed with fish paste. Equally impressive is their selection of fried wontons and tofu wrappers, although I usually avoid these as the goal is to be healthy. Once you select your ingredients, you head to the chefs counter to choose how you would like them to be cooked and served. Start by selecting your preferred noodle. The options are bee hoon (spaghetti-like rice noodles), kway teow (flat rice noodle) or yellow egg noodle. Or you can be even healthier and opt for no extra carbs! Then there is a choice of serving with soup or simply steamed and served dry. The regular soup here is very good as it is tasty and has no suspicious, grainy residue usually indicative of too much MSG. You can also choose a Laksa-based soup, which I haven’t tried as coconut milk goes straight to the hips. 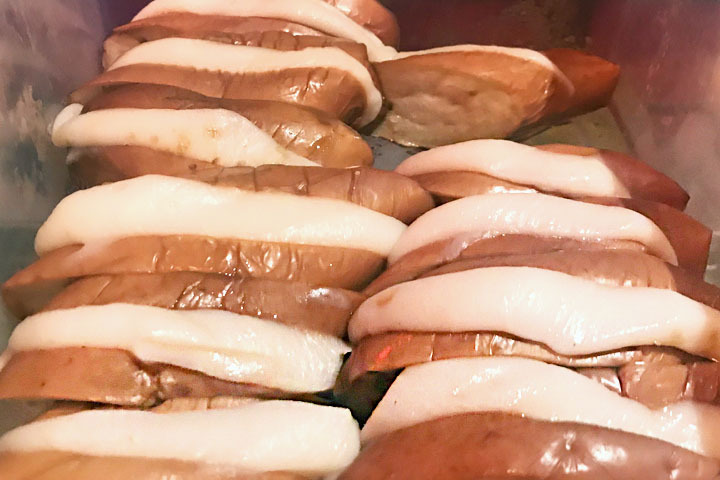 However those in the know will order their Yong Tau Foo dry and with no soup, whereby the chef steams the ingredients lightly and serve them with a very special and delicious secret-recipe sauce. The minimum number of ingredients you can select per serving at 109 is six and the average price for Yong Tau Foo is $6 a bowl. Cheap, cheerful and healthy! Fu Lin is my personal favourite. 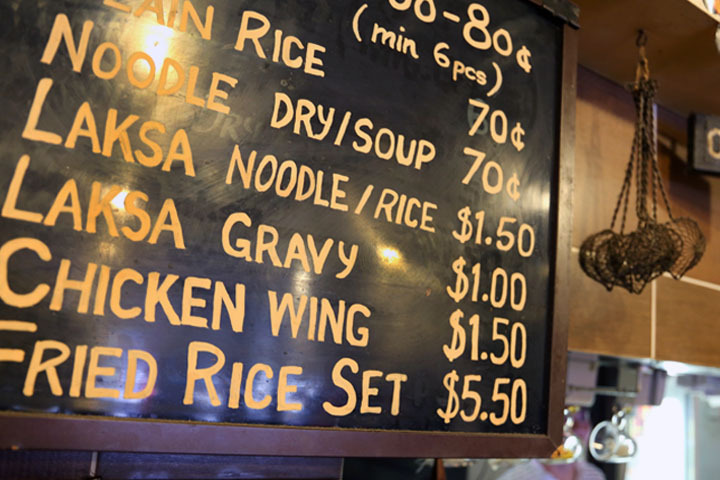 Whilst the number of ingredients to choose from is not as vast as 109, the quality is excellent, the portion sizes are generous and the price is very cheap. Most people choose to dine in therefore it can be really difficult to get a seat at lunchtime. However it works out to be even cheaper if you order food for take away so that is a good option if you are okay to eat your meal back at the office. My favourite ingredients are the fat aubergine slices stuffed with fish paste as well as bundles of fresh baby bok choi. I also appreciate the fact their Chinese cabbage is well cleaned with almost no traces of dirt. I will usually order my Yong Tau Foo served in clear broth , whereby the ingredients are steamed in a chicken-soup stock to enhance the flavour. Add a side of chilli or sweet bean sauce for extra taste. However the real specialty of this place are the fried wontons as well as their signature meat sauce. 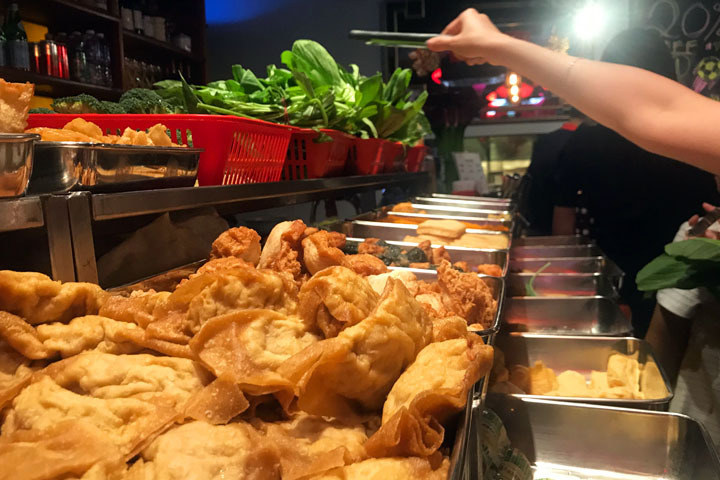 Most customers order their Yong Tau Foo dry, whereby the ingredients are steamed (except the fried wonton wrappers) and served with a thick dollop of hearty pork minced stew. This is an incredibly delicious twist on a Hakka favourite however something I only treat myself to occasionally as I can just taste all the calories lurking in that meat broth. Fu Lin Bar & Kitchen gets top marks for its originality, lowest prices and quality of ingredients. The NTUC Foodfare in the Clifford Centre basement always has an immense queue no matter how early or late you decide to take your lunch break. 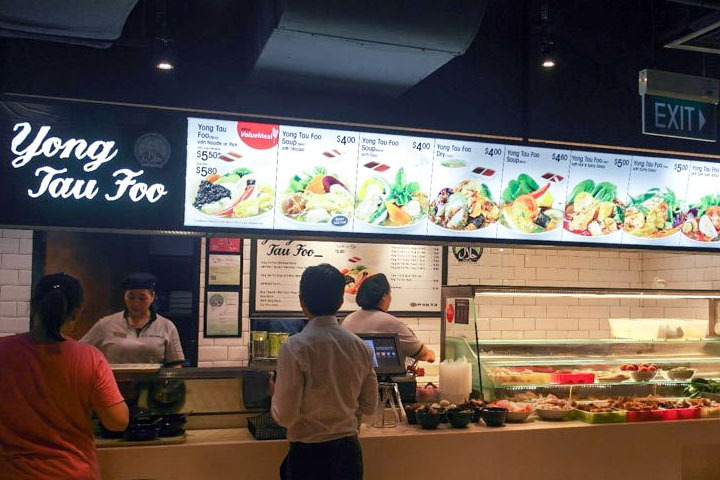 Whilst it is a reputable food stall it does not have the same variety of quality ingredients as 109 nor is it as cheap as Fu Lin, so I put those massive queues down to its convenient location in the food court. The choices of ingredients here include chilli, endive and bitter melon stuffed with fish paste, dried seaweed, enoki mushrooms, broccoli, Thai basil, bok choi, roasted eggplant, boiled eggs and sausage. But where the NTUC Foodfare has the edge is in its range of original Yong Tau Foo options. They have more than 8 different types of tofu with fish paste. My favourite are the flat square parcels of fish mixture wrapped in a thin, tofu lining that have an incredibly organismic, fishy yet meaty quality. The fat triangle wedges of firm, cream-coloured tofu with white fish stuffing in the middle are also really good. Here you have a variety of choices on how your ingredients can be cooked. Most people opt for the house specialty, which is steamed in a meat-based soup stock. The soup is a cloudy yellow colour and is delicious but salty. The second most popular option is cooked as laksa, although I do not enjoy their laksa soup base which tastes more artificial than creamy and has some suspicious residue lurking at the bottom. 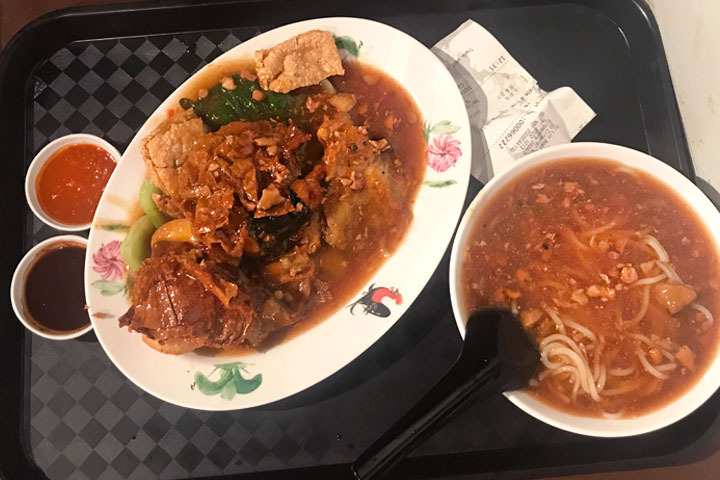 Ordering your Yong Tau Foo dry here is the most healthy option, however they steam the ingredients in plain boiling water rather than soup stock so it is tasteless as well as watery, given they don’t drain the ingredients properly. The Yong Tau Foo at the NTUC Foodfare is good value for money with the average bowl consisting of six ingredients usually costing less than $6. It is a convenient lunch option in Raffles as despite the long queues, the service is quick and they do not charge any extra for takeaway. They also have the greatest selection of optional noodles including bee hoon, kway tweow, yellow egg noodle, vermicelli and Korean instant noodle.